Discover if the latest VW Tiguan is the tow car for you, as we put it through its paces on road and track! Here is the new Volkswagen Tiguan – and it is bigger than its predecessor. VW is pushing the car upmarket, too, and prices have risen. Inside, there’s more space for passengers and their luggage. Under the skin, the Tiguan has much in common with the Seat Ateca and the Škoda Kodiaq, but is larger than the Ateca and lacks the Kodiaq’s seven-seat option. We’re testing the second most powerful diesel, the 187bhp 2.0 TDI. All versions with this engine have four-wheel-drive (the 150PS diesel also has the option of front-wheel drive). In flagship R-Line spec the car is very well equipped, but so it should be for £37,100. So, how well does the VW Tiguan tow? And can it justify its hefty price-tag? Fresh from a podium finish in its class at the Tow Car Awards 2017, we already know what tow car ability the VW Tiguan has. Stability is the quality we look for above all else, and the Tiguan has it in spades. At 60mph on the motorway, the VW coped brilliantly with crosswinds and overtaking high-sided vehicles. We pushed on to 70mph at the test track and had no nervous moments. It’s one of those cars that feel scarcely less secure with a van in tow than when solo. It copes with emergency manoeuvres, too. In the lane-change test we could see the caravan start to slide and sway in our mirrors, but the Tiguan stuck to its task – and to the road. R-Line models come with sports suspension, which is likely to contribute to the VW’s composure in this aggressive test – we’d be interested try the car on standard suspension to see what difference it makes. The Tiguan performed well in our braking test. Dry conditions will have helped, but the 10.3m stopping distance is reassuringly short. It makes easy work of hill starts, too. While testing the same car at the Tow Car Awards, we tackled a 1-in-6 slope. The electronic parking brake held the car still (there’s also an auto-hold function that works even if you don’t apply the brake yourself). The release was smooth and, with four-wheel drive and a DSG auto, towing to the top of the slope was straightforward. The strength of the engine helps, too. The power output of 187bhp is less important than the torque peak of 295lb ft.
That pulling power is available from 1900rpm to 3300rpm, so the DSG is rarely caught in the wrong gear. Matched to a Swift Expression 646 with a Mass in Running Order of 1453kg, the Tiguan pulled from 30-60mph in 10.9 seconds. In most circumstances we left the auto in ‘Drive’. However, we did change to ‘Sport’ at junctions and roundabouts for a livelier response to the throttle. If you want to go faster there’s a more powerful 240PS diesel, which also weighs 72kg more. However, when the 190PS car tows so well, we’d question the need to spend the extra £2410. The Swift made an 84% match for the Tiguan, just within the 85% matching guideline usually recommended for anyone new to towing. Experienced drivers will be reassured by the 2305kg towing limit, although we wouldn’t recommend towing a caravan weighing more than the Tiguan’s 1723kg kerbweight. If you are looking for a true heavyweight 4x4 at this price, then both the Hyundai Santa Fe and Kia Sorento are heftier. But really there’s little of substance to criticise about the VW Tiguan’s towing performance. It’s swift, stable and relaxing to tow with. The VW Tiguan is one of the best mid-sized SUVs to drive. However, R-Line models won’t necessarily be to everyone’s taste. That’s because the R-Line comes with sports suspension as standard, which stiffens the car and puts it 15mm closer to the ground. The suspension stops short of being harsh, but it’s certainly firmer than ideal if you are just pottering from A to B. However, if you want your SUV to handle well on an empty B-road, then the more sporting set-up starts to pay off. The car feels grippy and well balanced, and resists body lean. The driver profile selection system doesn’t alter the suspension, but a switch from ‘normal’ to ‘sport’ sharpens the throttle response and adds weight to the steering. Even so, the Tiguan is not as sharp as the new Mazda CX-5, which blends driver entertainment with a more forgiving ride, but it’s still rewarding by SUV standards. On the motorway, the Tiguan is reasonably quiet and comfortable. However, the 20-inch alloys and low-profile tyres do generate a lot of road noise over coarse surfaces, and there’s some wind noise around the mirrors, too. Without the extra weight of a caravan to pull, the 190PS engine feels even stronger. It really does make it hard to build a rational case for the 240PS model. There’s plenty of overtaking punch, and the DSG auto is reasonably responsive in ‘drive’ – although it’s worth swapping to ‘sport’ or using the paddles behind the wheel if you want really prompt gearchanges. All-round visibility is pretty good and the sensors and rear-view camera help when parking. However, the DSG doesn’t ‘creep’ as smoothly as the best conventional automatics. So long as five seats are enough, the Tiguan is a practical and well-thought-out car. There’s plenty of space up front, with enough adjustment for the seat and wheel to allow drivers of most shapes and sizes to be comfy. The seat bolsters are supportive when cornering, but not so snug as to be too narrow for a broadly built driver. At first glance the dashboard is quite conventional, but look more closely and you’ll see that, in place of conventional dials, there’s a TFT screen that can be customised to display different information. There’s also a ‘head-up display’ to project important data, such as the car’s current speed, into the driver’s line of sight (a £500 option). The finish is good, but some of the plastics on the lower dash and doors are rather hard. The upmarket cabins of the new Audi Q5 and the Mercedes-Benz GLC have more showroom appeal. Rear-seat passengers are better served than in the previous Tiguan, with noticeably more rear legroom. There’s also more space in the back than in the Seat Ateca which, although mechanically similar to the Tiguan, has a slightly shorter wheelbase (distance between the front and rear axles). There are air vents between the front seats to keep those in the back cool, with their own temperature control (this useful feature is standard on SE spec and above). The backrest angle can be adjusted, and the seats slide on runners to juggle legroom and luggage space. The boot is a square shape, and although the floor is quite high there’s no awkward lip to load items over. Levers on either side of the tailgate fold the back seats down, although this does leave a slope to the load area. So, as a five-seater the Tiguan is practical, but it’s not quite as appealing inside as prestige 4x4s and lacks the third row of seats available in some rivals. It’s hard to avoid comparing the Tiguan with the Ateca and Kodiaq, which share so much with it under the skin. Next to either, the VW looks pricey. It’s around £6000 more than the equivalent Ateca, and over £1700 more than the range-topping Kodiaq. However, What Car? research suggests that there are already discounts available, with savings of up to £3000. Your money buys a long kit list, too. R-Line cars have three-zone climate control, an 8in touchscreen, leather and a three-year subscription to the Car-Net online info service. The VW should hold its value respectably, with What Car? predicting a 45% return after three years and 36,000 miles. Fuel bills should be affordable, with an official combined figure of 49.6mpg. We achieved 28.5mpg when towing on a mixture of A-roads and motorways. This Volkswagen is a very good SUV – and a superb tow car. 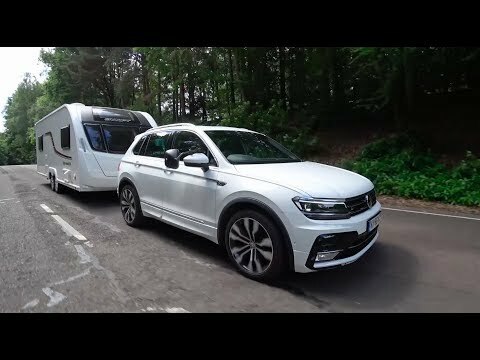 We’ve really enjoyed towing with the Tiguan: it just gets on with the job in hand, pulling a big twin-axle caravan with ease. The 2.0-litre engine gives the VW a healthy turn of pace and it has powerful, consistent brakes, but it’s the Tiguan’s stability that really sets it apart. We felt confident that the car was firmly in charge of the tourer, whether handling a motorway crosswind or bossing an emergency manoeuvre at the test track. How much of that is down to the R-Line’s sports suspension? We’ve yet to tow with a Tiguan without it, so it’s hard to say. However, from our testing at the Tow Car Awards earlier in the year we know that it feels more secure in strong winds than the largely mechanically similar Škoda Kodiaq. That sports suspension is a mixed blessing in everyday driving. There’s no doubt that the Tiguan handles well, but it does make for a firm ride. On a favourite country road it works fine, but when you just want to commute in comfort a more supple approach to rough roads would be welcome. Inside, there’s plenty of space for a family of four (or perhaps five at a pinch). Rear legroom is generous, and the VW Tiguan’s boot is a healthy size – sliding seats help you to tailor the cabin to best suit your needs. However, all this ability comes at a price. You can buy bigger, heavier SUVs for similar money. But you’d be hard pressed to find one that tows better.